Active Learning is generally defined as any instructional method that engages students in the learning process. In short, active learning requires students to do meaningful learning activities and think about and apply what they are learning. While this definition could include traditional activities such as homework, in practice, active learning refers to activities that are introduced into the classroom. The core elements of active learning are student activity and engagement in the learning process. Active learning is often contrasted to the traditional lecture where students passively receive information from the instructor. SCALE-UP stands for “Student-Centered Active Learning Environment with Upside-down Pedagogies” or “Student‐Centered Active Learning Environment for Undergraduate Programs.” SCALE-UP classrooms include round tables of nine students to facilitate group interactions, white boards near each table, networked computers and an instructor area located near the center of the room. How Does Technology-Enabled Active Learning Affect Undergraduate Students’ Understanding of Electromagnetism Concepts? “It’s Not You, It’s the Room”— Are the High-Tech, Active Learning Classrooms Worth It? LearnLab is a flexible, tech-enabled classroom that is anything but traditional. 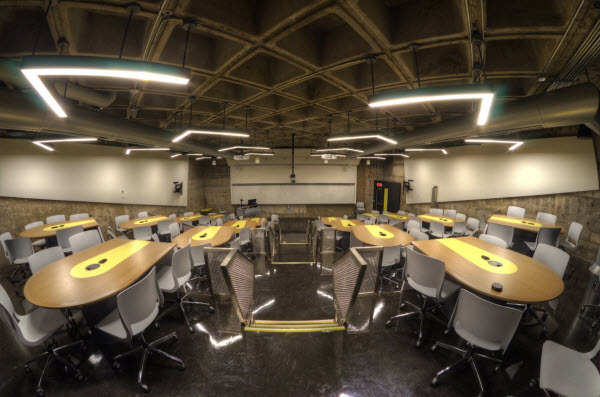 Instead of rows of desks facing forward, where the podium is the stage and blackboard the backdrop, LearnLab removes the front of the room by positioning chairs and tables into an “X” configuration. The new Learning Studios provided faculty and learners with an opportunity to experiment with radical flexibility in space, furnishings, and technology—all targeted at increasing student engagement and success. Team-based learning (TBL) is an instructional teaching method in which students work independently prior to the allotted class time to gain baseline subject matter knowledge. During class time they interact as a team (typically comprised of 4-7 students) towards a common goal of understanding class/course objectives. Compared to didactic lecture, the aim of TBL is to increase the level of the students’ engagement and promote a higher level of learning within the content. Turn 2 Team environments allow students to turn their chair 180 degrees in order to collaborate with the student(s) sitting behind them. If the floor is tiered, then two rows of seats are located on the same tier. The single, movable desk solution is mobile and flexible. It’s designed for quick, easy transitions from one teaching mode to the next, unlike traditional school desks and chairs.